Monin Raspberry (Framboise in French) syrup in a stylish 70cl glass bottle. The most common raspberries are red but originally all raspberries were white. Legend says that one day, the Nymph Ida tried to pick some wild white raspberries to calm the God Jupiter who was in a rage. While picking the fruits, Ida scratched her finger on the thorny raspberry bush. According to this Roman myth, her blood forever died the raspberries a bright red colour. In the Northern hemisphere, raspberries are in season in the summertime. 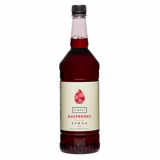 But don't wait for the season to enjoy fresh, ripe raspberry flavour in all your beverages! 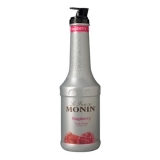 Monin Raspberry is available anytime. Colour: Natural colour of raspberry juice. Taste: Nose of ripe raspberry, slightly acidic, raspberry candy taste.. Applications: Teas, sodas, smoothies, cocktails, fruit punches, coffees (without milk, acidity can cause curdling), milkshakes. 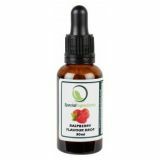 Sugar, water, concentrated raspberry and other fruit juice, flavouring. Total fruit juice: 25% minimum including 20% raspberry juice. Please note: Curdles in milk. So not compatible with drinks that are made with cold or steamed milk.